This image has a slightly vintage film look due to the post processing involved to deal with the extreme contrasts of detail in the shadow and the highlights coming down from above the next door room in this ancient underground tomb. 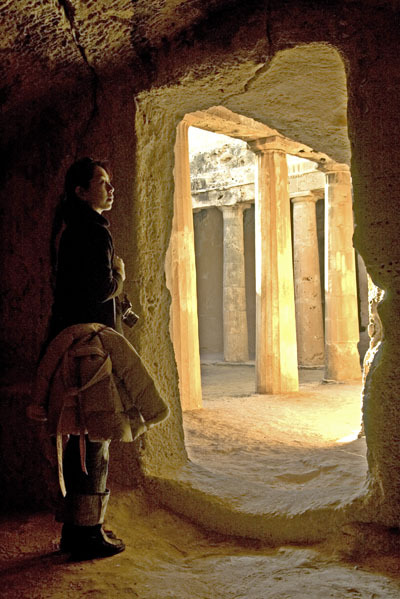 Spread over a vast area, these impressive underground tombs date back to the 4th century BC. They were carved out of solid rock with some being decorated with Doric pillars.The tombs were made to be luxury homes for the dead. High officials rather than Kings were buried here, but the magnificence of the tombs gave the locality its name. A nice 'tomb raider' feel to this Dan, well captured. There's a dusty, mysterious air to this image with some nice details and the inclusion of the girl in shadow helps the picture a lot. Good POV and lighting that makes this picture look like a video game drawing. Well taken, goo geometry but I'd prefer more contrast; the woman is not well pointed out. This picture it does have a strong mysterious mood. Great PP work to balance the light outside. I'm happy the woman is not as prominent, like this you eyes are drawn further inside the yard.